Drag up from the bottom of the screen to open the Control Center. When you turn AirDrop on, both Wi-Fi and Bluetooth are activated because sharing takes place with either of these types of connections. Off to turn AirDrop off. 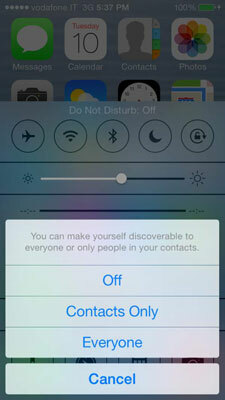 Contacts Only to give access to your iPhone only to people with iCloud accounts who are in your Contacts. Everyone to let everyone on the same Wi-Fi network with an iCloud account see your iPhone. Open whatever it is you want to share, say a photo in Photos. Tap the icon for the person you want to share with. The person receives a notification that you want to share something with her, and she can choose to Decline or Accept your shared item.